Thank you to all who participated in Use Your Stuff's "Tag! You're it!" challenge. Sorry it has taken a few weeks for me to post. Life....Need I say more! Below are a few of the tags that caught my eye, and I wanted to feature in my highlights post. Maybe it's because I have two daughters? Or perhaps the fact I worked in a card shop for five years and every congratulation card seemed to say the same thing....I absolutely LOVED this tag! 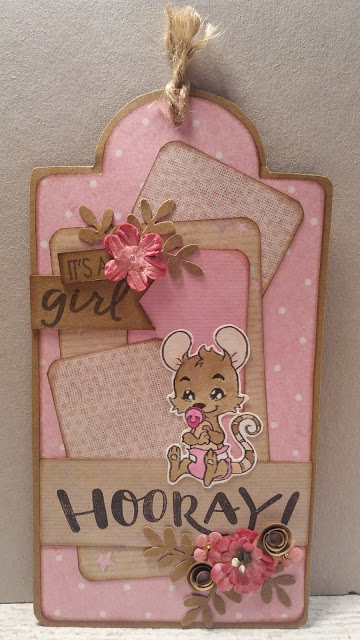 Beautiful use of colors and perfect for the new Mom who wants to scrap and does not have the time. This tag made my heart happy! What a great way to add some oomph to a baby shower present and to help a Mama out who wants to document her baby's first year. I love Christmas. 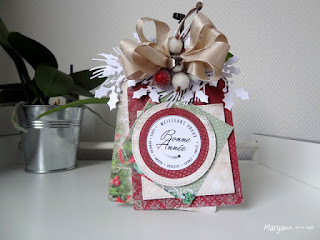 The snowflakes, the holly paper, the beautiful ribbon...This tag is absolutely gorgeous. Whoever receives a gift with this tag on it is surely going to feel special! Everything about these tags made me smile. The colors, the ribbons, the treats that are attached to them. Winter can be tough. Can you imagine the joy Georgiana will be spreading delivering this hand made gift? What a wonderful project! Once again, thank you to all who entered this challenge. Tags simply are a great way to let those creative juices flow when you don't have a whole lot of time or have scraps you want to use. The inspiration from each and everyone of you was contagious! I'm off to my scrap room now! Merci d'avoir choisi mon tag. Je mets le badge sur mon blog avec plaisir. Thank you for choosing my tag. I put the badge on my blog with pleasure. ooooo what a surprise to see my tag on this page. Thanks for showcasing my tags. I shared them at school with a few of my co-workers and they loved them.